I love this cold noodle dish on a warm day. 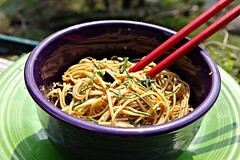 I started with this recipe from Nigella — Soba Noodles with Sesame Seeds. One of my favorite combinations is ginger soy sauce and maple, so I experimented a bit and came up with this. Toast the sesame seeds in a dry pan over a high heat. Put soba noodles and black trumpet mushrooms into boiling water and cook for 6 minutes until tender. Plunge them into ice cold water after draining. In the bowl you are going to serve them in, mix the vinegar, ginger soy sauce, maple syrup and sesame oil. Separate the black trumpet mushrooms from the noodles and dice finely, add to the bowl. Add the diced chives and the cooled, drained noodles and mix together thoroughly before adding the sesame seeds and tossing again. Let set in the icebox for 30 minutes. It’s even better the next day. This entry was posted in Black Trumpet Mushroom, Chives, Food, Mint. Bookmark the permalink. Post a comment or leave a trackback: Trackback URL. This sounds delicious, Lisa. I’m going to give it a try. I’ve given you a blog award. Come by when you have time.